September 9, 8 a.m. - 4 p.m. Relish the hunt in the charming town of Coburg. Here a historical setting has been the backdrop to the region&apos;s most acclaimed vintage and antique fair for the last three decades. Take home something special that tells a story! 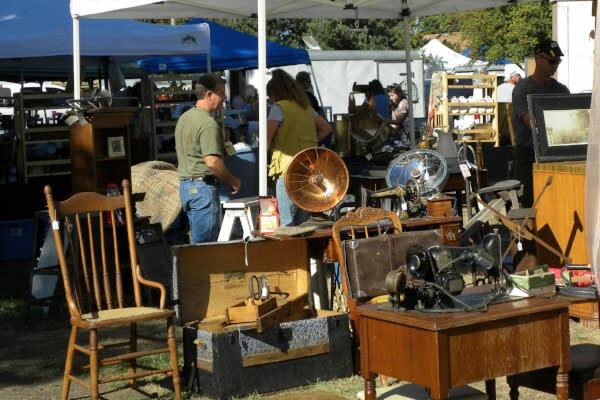 The Coburg Antique Fair was first held on the Sunday after Labor Day in 1987. Since then it has developed a devoted following of vendors and shoppers. Over 300 antique dealers attend, hailing from across the country and drawing over 15,000 treasure hunters. The Coburg Antique Fair is particularly special because it is set in the historic town of Coburg. With the picturesque backdrop of historic buildings, the careful adherence to visual standards and product integrity; the fair&apos;s nostalgic atmosphere surpasses the typical flea market. No items newer than 1970 are allowed, with the exception of remade items (vintage items re-purposed, such as turning wagon wheels into tables). Collectors can find heaps of enamelware, cast iron, brass, copper, china, vintage tools, kitchenware, galvanized washtubs, vintage linens, jewelry, toys, books, sports memorabilia and artwork. Decorators seek out large shabby chic pieces, restored furniture, metal lockers and obsolete objects. Artists can find inspirational items for collages, multi-dimensional compositions and sculptures. There are also crafty twists on older materials, like children&apos;s dresses made from vintage pillowcases or rustic rake heads turned into wall hooks. From prized European antiques to kitchy junk, the Coburg Antiques Fair offers a find for everyone. The Coburg Antique Fair is sponsored by the Coburg Chamber of Commerce and centers around the Coburg City Park. At its heart is the gazebo stage featuring live musical entertainment. Food trucks and carts provide dining options for picnicking. Vendors&apos; antique booths line the streets bounded by Diamond & Locust Streets and Harrison & McKenzie Streets. This annual one-day mega-event now consumes the whole town. Outside of the marketplace, browse more of Coburg&apos;s notable vintage, re-sale and thrift shops plus residents&apos; yard sales. Officially, the Coburg Antique Fair opens at 8 a.m.; however, if you are a serious collector, you&apos;ll want to arrive early. No sales are allowed before 4 a.m., but at that magic hour groups of shoppers start to arrive armed with flashlights. Dawn is around 6 a.m.
Another benefit of arriving early is free street parking. When those spots are gone, there is pay parking for $5 a car at the Marathon Coach campus (91333 Coburg Industrial Way) with free shuttle service to the fair, operating from 6 a.m. - 6 p.m.
RV camping is offered at nearby Armitage Park. 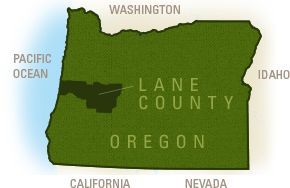 Additionally Eugene Kamping World and Premier RV Resorts offers overnight options. The Coburg Antique Fair is the same weekend as a University of Oregon Duck football game so book your accommodations early. Coburg is located in close proximity to both Springfield and North Eugene/Downtown Eugene. Set a budget for yourself and bring bring cash. It&apos;s a great idea to have plenty of smaller bills. But if needed there is access to ATMs. Bargain. Why not? This is a good reason to have plenty of smaller bills. Dress in layers as it can be cool in the morning but quickly heats up by afternoon. Bring shopping bags, and depending on your shopping ambitions, bring a wagon or rolling cart to haul your loot around with you. The Coburg Antique Fair is free to attend. Plan your trip to Eugene, Cascades & Coast. Bring Recycling presents a sustainable home and garden tour showcasing creative reuse of materials. On Saturday, visit both the Museum of Art and the Museum of Natural and Cultural History. 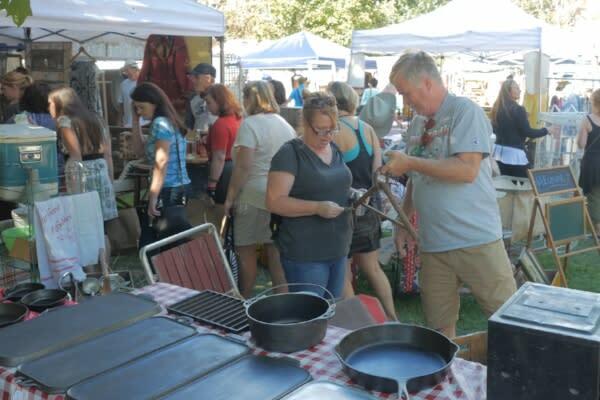 This quintessential Eugene market features artisan crafts, delicious food and live entertainment. Tour twenty historic covered bridges across the county.